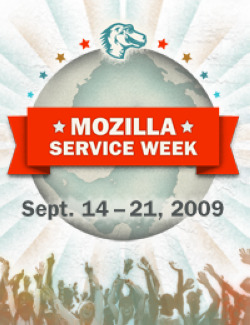 Socialbrite is a partner in Mozilla Service Week, which runs today through next Monday. The initiative inspires tech companies across the globe to offer their talent and expertise to local organizations that need their assistance. Help install a wireless network at a school. Update a non-profit organization’s website. Teach the values of the open Web to other public benefit organizations. Choose from a list of over 3,500 service opportunities on our partner sites (Idealist & betterplace.org). There is a plethora of opportunities, including helping The Nature Conservancy of Chicago, IL with its photo archive, developing a LinkedIn group for Wardrobe for Opportunity in Oakland, CA, helping CARE, Germany’s largest NPO, and keeping Mexico’s Puente a la Salud Comunitaria’s website up-to-date. Our partner OneWebDay also has a variety of service events taking place on and around Sept. 22nd, including a number of events in San Francisco. You’ll also want to learn how you can take part in OneWebDay on Sept. 22 to make the Web better. Begin by following @owd on Twitter and donating your Facebook status on Sept. 22.